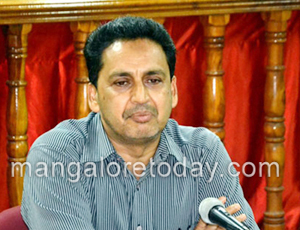 Mangaluru, July 11, 2015: Chairing a meeting July 10, DK DC Adoor B Ibrahim stated that public opinion would be collected before allowing traditional sand mining in CRZ region. He added that there is a need to look into pros and cons of traditional sand mining in CRZ area. Fisheries College and NITK was asked collect opinion from the public. The public can detail objections to the traditional sand mining in CRZ area during monsoon, also to Mines and Geology official before July 20. Fisheries Department Deputy Director M D Prasad said sand mining in CRZ area during monsoon will affect fish population. The fish lay eggs in the river during June. The mining will affect the eggs. Those who have been engaged in sand mining for eking out livelihood said traditional sand mining will not affect the fish population. The use of excavators like JCB and machinery will affect the fish population. The Mines and Geology department has failed to act against those who extract sand using machinery. Leaders of the sand contractors said, traditional sand mining in the region is on for near half a century now. Honest efforts to safeguard environment are followed. There is no truth behind the allegation that sand mining has affected fisheries activities. The fish population declined due to release of pollutants to the river and sea. Mines and Geology official said by making GPS mandatory for the sand transporting trucks, illegal sand mining can be checked. DC directed the officials to curb illegal sand mining where sand is extracted using JCB and other machinery. The police force can be used by the officials. After seizing the machinery, penalty should be imposed. The official said that a total of 242 permits including 74 new permits have been issued to extract sand from 38 sand blocks in DK. A sum of Rs 51,64,360 has been collected as fine in connection with illegal sand mining during the year. Additional DC Sadashiva Prabhu, AC Dr Ashok and Additional SP Shantha Kumar were present.